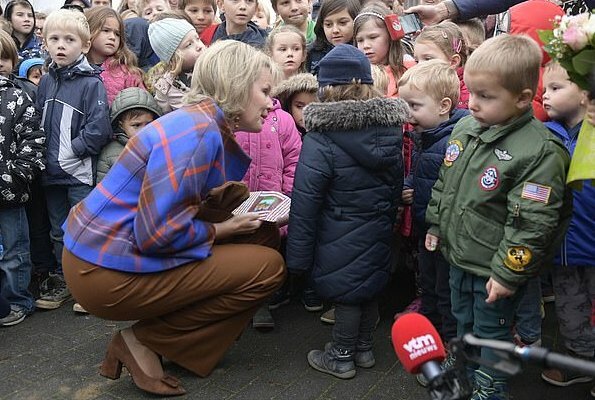 On November 16, 2018, Friday, Queen Mathilde of Belgium visited ’t Vlindertje Kindergarten (kinderdagverblijf ’t Vlindertje) in Boutersem in the Reading Week. The Queen attended interactive reading out education for little children. That education programme is organized by Iedereen Leest. Iedereen Leest (Everybody Reads) is a non-profit organization and wants to inspire people to read (more).. The organization was established by the Flemish government and is funded by Flanders Literature (the Flemish fund for literature). What a wonderful program and wonderful queen to participate so thoroughly. You can tell she has been a mother and teacher as well as a queen. She is wearing a very suitable - and attractive - outfit for getting down to the floor with little ones. What a lucky little boy, he is held by the Queen and looking at a book together. Just the right outfit for the Queen for this event. 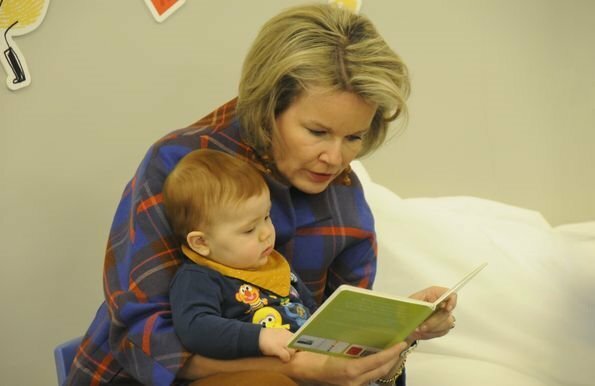 The baby looking at her, as she is reading, is just precious. What an adorable baby. These babies are so cute! Great initiative- the Queen looks great, practical but smart, perfect for the event. Minor quibble - I personally don't like this "big hair" on her, I just find it a bit matronly. Wonderful event indeed! Mathilde looks happy to be there. She is appropriately dressed with just a bit of flair. Very appropriate attire for the event and I love her shoes. Stylish and they look comfortable for crawling on the floor with kids. She looks extremely comfortable with these cute kids. 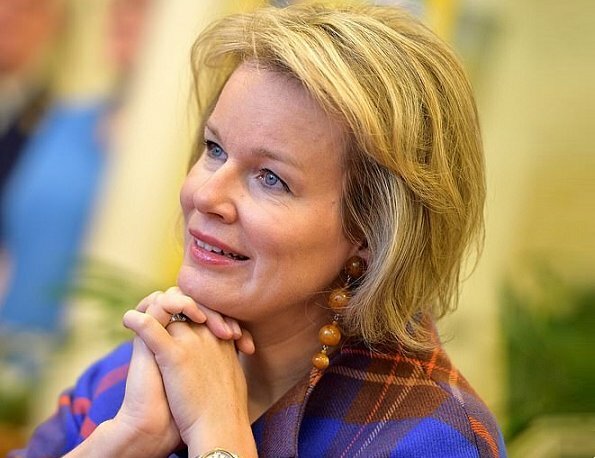 Beautiful appearance of Queen Mathilde. The blue in the jacket is quite striking and pretty. Little boy in his Sesame Street shirt is too cute for words. Such a cutie patootie!! I can see why the queen would want the hold him for as long as possible. God Bless them all. Queen Mathilde seems to be a very friendly, intelligent and lovely woman! I like her anyway, she resembles my sister-in-law.